16th April saw the first episode of a new Virtual Reality property show on BBC2. ‘Your Home Made Perfect ’ shows two architects using VR and green screen technology to pitch their contrasting ideas for a couple’s new home. The clients can then walk around each design in VR and ‘try before they buy’, before making a decision and going ahead with their chosen build. If this is all sounding familiar, it’s because we have been using our 4D technology to allow customers to test-drive their new kitchen or bathroom for the last couple of years, and all without the TV trickery the BBC uses. While there’s no denying the visual effects used within the program are impressive, imagine how wowed your customers will be when you change cupboard fronts or switch to night-time, right in front of their eyes. What’s more, using our 4D Theatre, the client doesn’t need to just look at their new design, they can interact with it by opening doors and turning on taps. 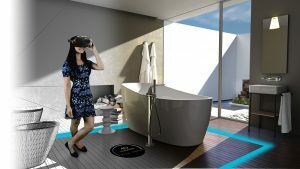 It’s really exciting to see these practical uses of VR being more widely publicised and this is a great opportunity for our 4D retailers, as consumers look to replicate the experience they have seen in the programme. If you use our Virtual Worlds Professional CAD software but don’t have the 4D module, now is the time to get involved and make the most of the interest that ‘Your Home Made Perfect’ is certain to generate. If you do have Virtual Worlds 4D, then make sure you tell your potential customers, and watch the sales roll in!